As a self-taught makeup & skincare junkie on a budget, I am always testing out new products from affordable retailers, picking through the clearance bins, or stalking for sales. Just because an item is sold at a lower price point than expected, that does not mean it's a cheaply made product. Below is a list of my ALL TIME FAVORITE products I am bringing with me into the new year. As a youngin' I rarely EVER paid attention to how important caring for my skin is. I figured wearing concealer and layers of eyeshadow, liner and blush would hide the fact that my knowledge was at a minimal. As I've gotten older, I realized that our skin clarifies from the inside out. What we put into our bodies shines through our complexions, skin textures and clarity. Hashtag WATER. Hashtag LIQUIDS. Hashtag HYDRATE. Anyways....onto my favorites. 1. Purpose Gentle Cleansing Wash I tried for years to find a face wash that successfully cleansed my skin of makeup and dirt, but was gentle enough for my sensitive skin. In the winter, my face would become dry, and in the summer my forehead and chin would break out into clusters of small bumps from humidity. I stumbled upon this soap not thinking much of it, but it has become a lifesaver. It's gentle enough for sensitive skin, but powerful enough to break down 95% of my makeup. 2. Clinique Clarifying Lotion I LOVE THIS TONER. Never in a million years would I believe so firmly in a product. As a part of my nightly skincare routine, this toner flakes away the dead skin from my face, and removes excess dirt that my cleansing wash had missed. It immediately cools the skin, making it feel like every pour has been opened and cleansed. This revitalizing spray is refreshing and leaves my skin with a healthy glow. I use this after I wash my face before bedtime, prior to applying makeup, and after application for a setting spray. It leaves my face feeling clean and moisturized without over-drying. 1. Carol's Daughter Black Vanilla Leave-In Conditioner I associate myself with the small percentage that does not regularly use conditioner. They weigh my hair down, creating a flat, lifeless mess that has a mind of its own. This spray has changed all of that AND even saved my ends. If you have thin hair like me that is only able to hold any style when dirty, I recommend this product. It will not weigh your hair down and leaves your hair soft and lightweight without over-cleansing. I could blab ON & ON about my favorite cosmetics. Choosing only a few was quite difficult for me. I'm always on the lookout for a product that's a) inexpensive b) worth the size and c) has an all-day wear. The following are my hands down, all-time favorite products that I will continue loving into 2018 and beyond. 1. Tarte Shape Tape: So worth the $27. The wand is wide which provides more coverage with less product, and the formula is super formulated and rich. My under-eye circles in the morning completely disappear with a few strokes of a beauty blender and some Shape Tape! 2. Elf Clear Brow & Lash Mascara Elf is a hit or miss, but I LITERALLY can't live without their brow gel. I tend to not fill in my brows completely, and use this gel to comb the hairs upwards. They stay in place and are surprisingly tame throughout the day (and night). 4. NYX Matte Bronzer NYX always wins as the underdog with cosmetics. Their bronzer formula is super pigmented and leaves my cheeks with a summer glow all year round. The only downside of this product is that I find myself touching up more than usual after a few hours but overall, 9/10. 5. bareMinerals Bare Pro Powder Foundation I NEVER wear liquid foundation so I was on the search for an alternative to even out my skin tone in the winter months. Liquid tends to look heavy and open up my pores. However, I figured I would spend a little bit more ($30) to try a powder foundation instead. Now let me tell ya, this is SO lightweight for a medium coverage. 6. NYX "Love in Paris" Eyeshadow Palette in Merci Beaucoup This tiny palette packs a PUNCH. The colors are beautiful on their own as dry shadows but become intensified when wet. The deep gold and burgundy look fabulous on any skin tone. 8. Colourpop Lipsticks If you have a vast lipstick collection like I do, you NEED to check out Colourpop Cosmetics. They are my go-to everyday lipstick at $6 a tube. Their liquid to matte and Ultra Satin Lip are making their way to the top of the lip chain. One coat will last me almost ALL DAY. 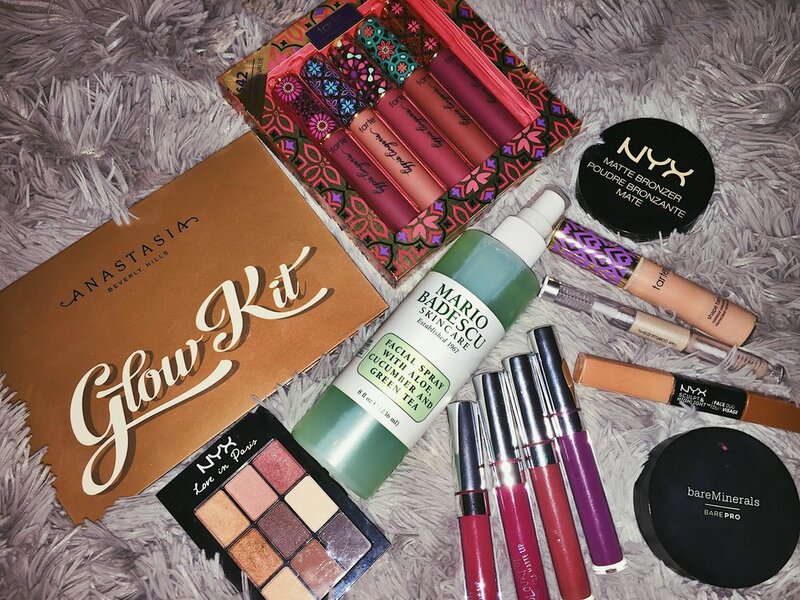 Follow me below for more fashion, beauty and skincare posts like this one!